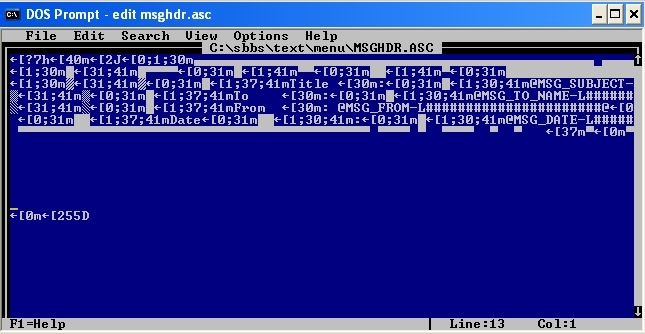 One of things I used in my Proboard and RG setups in the ’90s was custom message headers…i.e. OBV/2 style. I’m trying to get away from the stock setup and this is one of the things that bothered me most. Open your ansi in TheDraw or whatever program you’re using to edit them. Make sure to select your foreground and background colors so that they match what you want the end result to be. You can find the current list of @-codes over at the Synchronet Wiki. Here’s about what the file should look like when you’re finished editing it in TheDraw. This is the part that had me stumped for more than an hour this afternoon trying to get to work correctly. The -L at the end of the code tells SBBS to align left and the #’s are how much padding you want. Otherwise you end up pushing the stuff to the right onto the next line and it looks like crap. 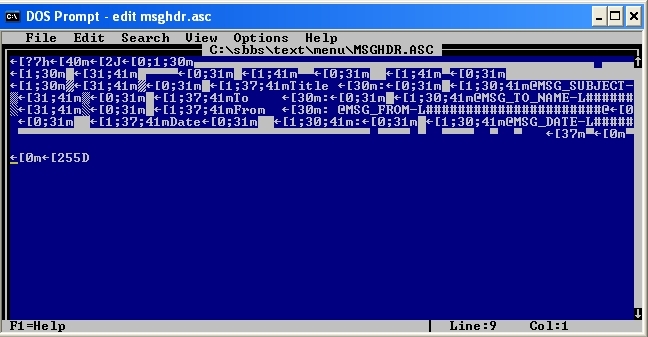 Type edit msghdr.asc so that you’ve got the ansi open in your DOS text editor. Here’s what it looks like before making changes. The top few lines are the only ones we are concerned with. At first I thought I needed to replace all of the first 9 or so but once I started editing and playing around I realized I could just replace prompt #1. 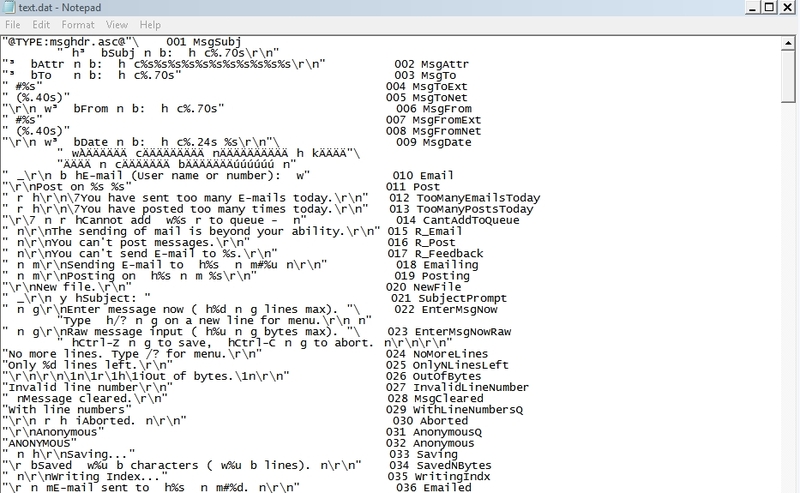 The line that say TYPE tells SBBS to display a text file for that prompt. Save your text.dat and reload your configuration and you should be ready to go. There’s bound to be an easier method to do this but it’s working on my system. If you have any questions or better ideas please let me know. Updated. As I mentioned in the paragraph above, there IS an easier way to do this (duh). You can find it at http://wiki.synchro.net/custom:messageheader If you are using a custom you’ll still probably need to pad some of the strings as I mentioned above.